First look at 'Project Neon'. Tom Hounsell via Twitter. Click for original. Visual changes are coming to Windows 10. Looking past the upcoming Creators Update, Microsoft is working on an updated design language that it internally calls Project Neon. We've heard about this before, though it hadn't been officially recognized by Microsoft until now. Microsoft gave developers a first look at Project Neon during a keynote at its Windows Developers Day event. There was some large text piled on top that obstructed the screenshot, though PCWorld discovered a clean view by Twitter user Tom Hounsell. That image is shown above. According to Windows Central, Microsoft's goal with Project Neon is to "add fluidity, animation, and blur to apps and the operating system." It's a visual overhaul that will affect a range of Windows 10 devices, everything from desktops and laptops to HoloLens, Windows 10 Mobile, and Xbox. Microsoft has even begun providing Project Neon APIs in its Windows 10 Preview builds so that developers can start utilizing the new UI and design language. While official information is rather scarce, it appears that Project Neon is an attempt to beautify Windows 10. MSPowerUser leaked a handful of additional screenshots a month ago and said at the time that Project Neon isn't a major or complete overhaul of Windows 10's design language. Instead, it's a "minor update" that Microsoft is building on top of the current Windows 10 UI. 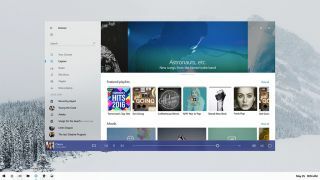 In the screenshot above, there is an open Groove Music window without a dedicated title bar. The options to close it out, minimize, and maximize the window can be found in the upper-right corner. Also visible is a more streamlined taskbar. It's not a lot to look at and of course elements such as animation and blur effects can't been accurately portrayed in a still shot, but it's a glimpse nonetheless. Microsoft has to be careful with tweaking the look of Windows 10 so that it doesn't alienate users and push them back to Windows 7. Windows 10 has seen steady growth and has proven popular among gamers—around half of all Steam users run Windows 10—but if the changes are too jarring, users might seek out greener pastures wherever they can find them.